Fall always makes me think of hunting – all kinds of hunting. From deer to waterfowl, now is the perfect time to hit the woods and enjoy the great outdoors. Mario Friendy is a Mossy Oak ProStaff member. Mossy Oak has a group of the top outdoor men and women from across the country that act as spokespersons for the brand and share their knowledge. Mario is one of the top waterfowl hunters in the country. He operates Columbia River Decoys which is viewed as one of the best custom decoy producers in the waterfowl industry. 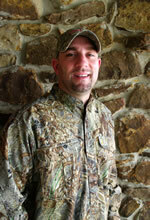 He is a top guide and can offer you helpful information for your next waterfowl hunting trip. Question: What do you look for when scouting for places to hunt ducks and geese? Answer: The first thing I look for is a food source. Then, does it have cover to conceal the hunters? Last but not least, can I use the sun and wind to my advantage? Question: How do you decide on your decoy placement for ducks? Answer: The only thing I try to do is leave an open hole in the decoys for them to land. I don’t care about decoy patterns like J or X. Question: Do you use different decoy patterns when setting up? Do you change the spread during the hunt? Answer: I don’t use any patterns. All I try to do is leave a hole near the boat or blind so the birds can land. I will change the spread as many times as I need to so the hunt works out. Question: Do you use layout blinds when field hunting for ducks & geese? If so, where do you place them in your decoy spread? Answer: We use layouts for geese but because of the lack of cover in the fields we hunt, we are always on the edge of the field away from the decoys. Question: How do you conceal your blind and hunting area? Question: What are your basic calling tips for ducks? Answer: Study ducks, listen to ducks and read the ducks while you are in the field. Do what is only needed as over calling will blow them out. Question: What are your basic calling tips for geese? Answer: Study geese, listen to their sounds and try to imitate those sounds. Geese make certain sounds at certain times. Try to make the right sounds at the right times. Question: How can I be a more consistent shooter on ducks & geese? Answer: Stay consistent. Use the same gun, choke and shells if possible. If you change shells at least stay close to the same speed so your swing and follow through are the same. Practice! Question: Do you use different chokes in your shotgun depending on the type of hunting? Answer: I shoot a light modified choke all year for both ducks and geese. Question: How can I attract waterfowl to private property? Answer: Planting food is the main attractant. BioLogic Guide’s Choice and a selection of Nativ Nurseries trees will turn your duck spot into a place the ducks want to be. Question: How do you introduce youth to waterfowl hunting? Answer: Getting kids into the outdoors is important and a few key things to keep in mind is to make sure the focus of the hunt is on the kids. Do what they want to do, stay as long as they want to and make it fun. Start them young, keep it fun and they will grow into the Mossy Oak outdoor lifestyle we all live. Good luck on your next hunting trip! This entry was posted in Hunting and tagged biologics guide choice, calling tips for ducks, calling tips for geese, columbia river decoys, decoy placement, duck hunting trips, how to hunt ducks, mario friendy, mossy oak duck blind, waterfowl hunting trips. Bookmark the permalink.